Today, I screwed up my Ubuntu, again. One thing I learned while I have been being used Ubuntu is that, reinstalling Ubuntu can be much faster than stucking in a difficult problem which might not be able to be solved forever. Today, after realizing all environment variables are screwed, I quickly reinstalled Ubuntu 16.04 (rather than Ubuntu 14.04!) and set up the environment for machine learning research as follows. I am leaving my records for myself as well as for those who also need a manual to quickly setup Ubuntu 16.04. Before starting the installations, I would like to remark that the shortcuts of copy / paste in terminal(Ctrl+T) are Ctrl+Shift+C or V rather than Ctrl+C or V. You can copy and paste the following example codes for your installation except for specific filenames. All notes are written based on python 2. For installing on python 3 rather than python 2, you may need little changes such as using pip3 and python3 instead of pip and python. [Warning] This is the most dangerous part in Ubuntu setting. Installing a wrong driver can make fatal errors for your system, e.g., infinite login loop. Thus, make sure to backup all your important files before installation. I followed this article for Nvidia driver installation. First, download a Nvidia driver file which is compatible with your graphic card from here. You need to block nouveau before installing the driver. Make a new .config file as follows. Now, you need to reboot and log into tty mode. You can access tty mode via Ctrl+Alt+F1. CUDA for Ubuntu 16.04 is not released yet. I found an [article][L_CUDA_16.04] for installing CUDA on Ubuntu 16.04, but I don’t recommend it because it is too dangerous (or challenging). You may refer to the CUDA installation guide given by the official Tensorflow website. Go to cuDNN website and download cuDNN(v4) library files after registration. 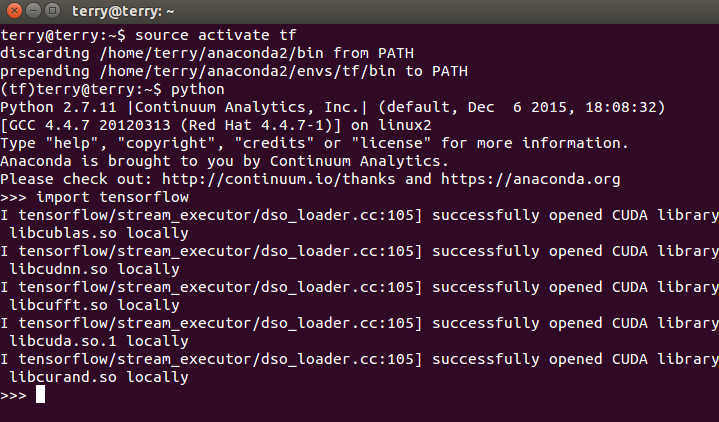 If you see a failure message in import tensorflow even though you have successfully installed Tensorflow, it may be because you have used sudo during the installations of Anaconda or Tensorflow. In this case, uninstall Anaconda (simply delete the Anaconda folder with $ sudo rm -rf ~/anaconda2) and correctly follow the instructions again. If you have installed Tensorflow(gpu) but fail to load libcudart.so.7.5, it may be because you didn’t change the permission of the lib files or edit .bashrc file. Please check the instruction for CUDA installation again. Search a proper version of Theano before installing it using conda. You can manage each Conda virtual environment, independently. In other words, you can install and use different versions of python packages in different virtual environment. Here is some packages you may want to have installed. Note that we are going to use conda install instead of pip install. For loading .RData to python. $ git config --global user.name "GitHub username"
$ git config --global user.email "GitHub email"
If you are using Ubuntu 14.04, you may get ruby v1.9 instead of v2.3. To get ruby v2.3, follow the instructions bellow. * I will keep updating this post for including, e.g., CUDA installation on Ubuntu 16.04. for GPU computing. The followings are additional notes for my Ubuntu setting.